Get The Most Popular Event Attraction! Our mobile climbing wall was the first portable rock climbing wall to offer four climbing stations and a realistic climbing surface. It is specifically designed to look and feel like rock without using an abrasive wall surface so that you can accommodate the full range of climbers. Good looks, reliability, and versatility make this the best portable rock climbing wall on the market. Safe, Fun, Exciting, and Challenging. The perfect addition for...Fundraisers, Team Building, Corporate Picnics, school Carnivals, Grand Openings, City Events, Festivals, Trade Shows, Celebrations, Galas, School Events, Birthday Parties, or your own unique event! Our 25 foot tall mobile rock wall is easy for our staff to install at your site. In only 15 minutes up to four climbers can simultaneously be scampering up the mobile wall. Please call in advance as this ride is Houston's Hottest Party rental item being booked for all occasions! 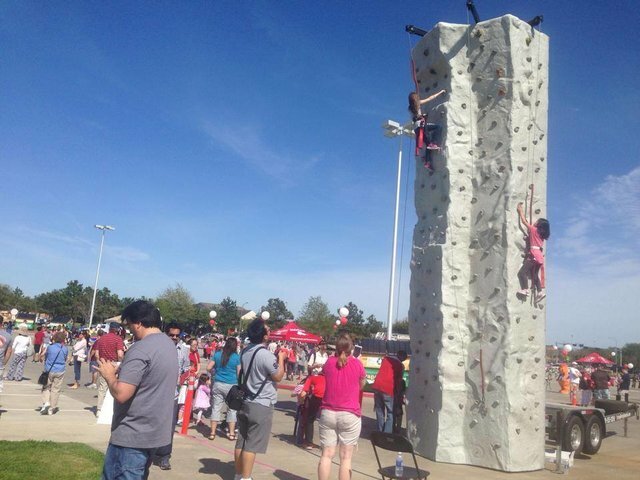 Our Houston climbing rock wall rentals are the perfect addition to any special event you may be planning. We are the best choice for all your party rental and party entertainment needs. When it comes to planning your next special event- just make a call to Spring Party Rentals and we will do our best to serve you!